The view from the 2nd tee, the first of many tee shots requiring a fade into a fairway that dog legs to the right. After an extended winter of miserable weather in Central Kentucky, the Wife and I finally escaped to warm, friendly Hilton Head Island, South Carolina for a much needed vacation. We were driving south as four to six inches of freezing rain and snow were falling in Lexington. I could barely get sleep in our beautiful Marriott Surf Watch villa Sunday night in anticipation of feeling the warmth of sunshine on the golf course the next morning. Early March on Hilton Head is colloquially known as “shoulder season,” the time after the worst of winter has passed, but before the spring peak season, when blossoms and green grass dominate the Island’s visuals. The Bermuda grass is still largely dormant, leaving the golf courses varying shades of brown, as the green annual rye grasses cling to life. Trees overhanging the front of the fairway, creating a narrow chute through which to route the tee shot, were a predominant feature of the Hills Course. The Island was probably half full upon our arrival, filled predominantly with snow birds from New England, the Upper Midwest, and Canada. I was shocked to discover very quickly that we had driven 600 miles south and it sounded like we’d landed in Yonkers. Two days in I have yet to hear a truly Southern accent. Fortunately, the greens fees reflect the diminished demand for tee times. 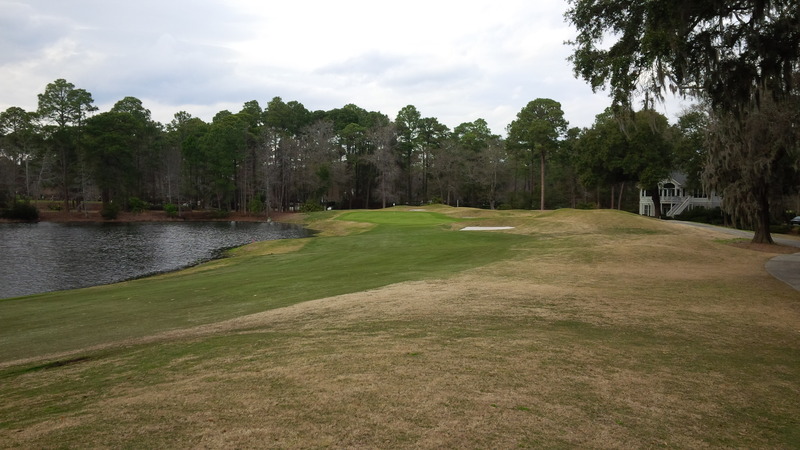 I began my week on the Arthur Hills Course at Palmetto Hall Plantation Club. The Hills Course opened in 1991, when it was voted one of the best public courses in the US by Golf Digest. Despite the moniker “The Hills Course,” the golf course was very flat, as one would expect of the South Carolina Lowcountry. The Blue Tees play to a course rating and slope of 72.7/139 at 6,582 yards. The pond hugging the left side of the 8th hole was one of the few water hazards that was visible before the shot was struck. 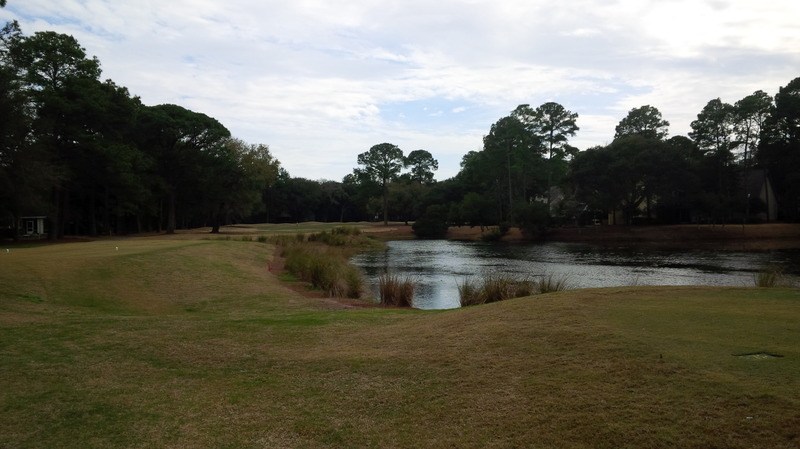 While the lack of elevation change was convenient for judging shot distances at sea level, it also meant that a lot of the ponds and bunkers were hidden from view from as little as 75 yards away. A favorite public course of the locals, the Hills Course is one that a little local knowledge probably would go a long way. There was no GPS device on the cart, so I relied on the scorecard, fairway markers, and my smartphone golf course app, though in retrospect, I really should have forked over the $8.00 for a yardage book. Other than one twosome that I caught and played through on the 5th hole, I had the entire course to myself as a single. Considering that this was my first round of the year, compounded by the fact I was three lessons into a complete swing overhaul, the opportunity to play by myself was a real blessing. The short Par 4 12th hole was a great risk/reward hole that penalized me severely for trying to cut the corner and missing. Badly. The fairways were in good shape for early March, though my observations were filtered through eyes that hadn’t seen anything green since Thanksgiving. 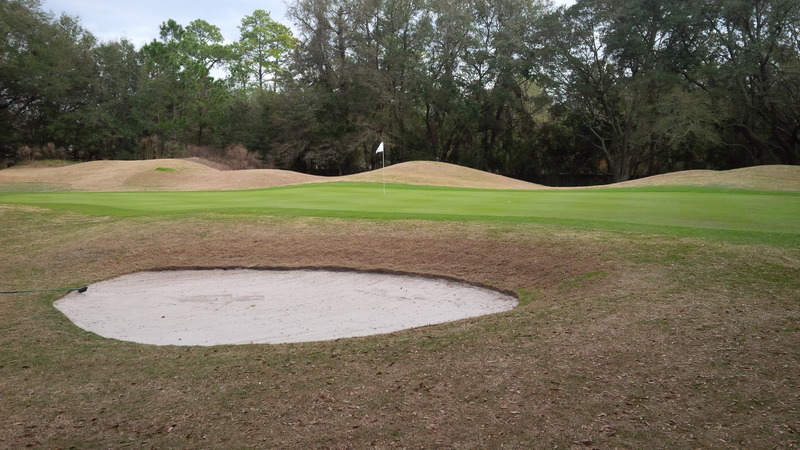 The Bermuda grass had barely begun to awaken in spots, and the rye grass had held up pretty well given the unusually long, cold winter Hilton Head had endured. Almost all the fairways and greens were framed by mounding, the kind of rolling hills that were prevalent in the late 1980’s and 1990’s golf architecture. Thick stands of pines, magnolias, and oak trees aligned the fairways outside the mounding and cart paths, though many trees conspicuously stretched out over the fairways, forcing golfers to shape their shots accordingly. The Hills Course winds through the Palmetto Hall Plantation neighborhoods, with the minimum setbacks I’ve come to expect on Hilton Head. The houses weren’t extravagant, like you would find at St. Marlo in Johns Creek, and I never felt like the houses were intrusive to the course. The greens were really firm. Despite hitting several greens with a variety of shot flights throughout the day, I only produced one ball mark that required repair all day. Regardless of how high or with how much spin the ball landed on the green, the shots consistently released 15 to 20 feet from their landing spots. The greens were generally lengthy from front to back, but were rarely as wide as the fairways, with collars that narrowed to frame the putting surfaces. The 15th green was representative of the Hills Course greens; long, slender, surrounded by mounds. Mercifully, the greens were plenty green in color, though they looked a little patchy in places where the rye overseed had worn thin. Nonetheless, the greens rolled true all day. I would even argue that these particular greens rolled a little slow, as the putts stayed much straighter than I anticipated given all the not-so-subtle undulations. Overall, I would place the condition of the course as B+, which was more than sufficient for these golf-course-starved eyes. As for my actual performance, I would be lying if I didn’t confess that I was a bit nervous to find out how my work-in-progress swing would hold up on the course. My pre-round range session helped knock the rust off, but didn’t instill much confidence. At some point, I resolved just to trust my new swing and get around the course as best as I could. 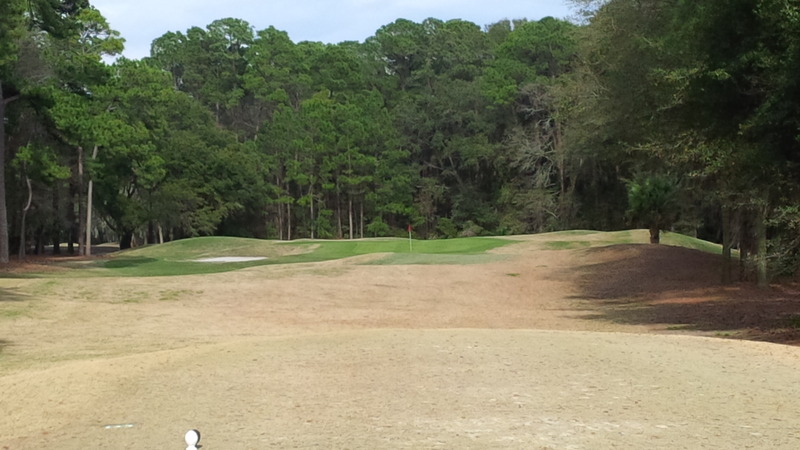 The rye grass greens really stood out as oases amongst the sea of still dormant Bermuda rough. I found the front nine utterly frustrating because five of the seven non-Par 3 holes were dog legs to the right, requiring a fade. This didn’t jive at all with the new swing I’m developing, which decidedly produces varying degrees of a draw. 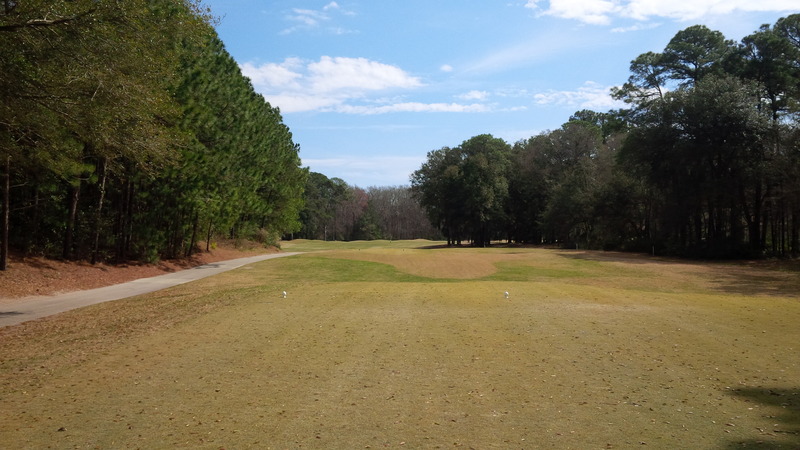 Even from the back tees, I was forced to pick a spot to aim for and hope I didn’t run it through the fairway, or miss right and end up in the trees, mounds, and pine straw framing the dogleg. More often than not I tried to cut the corner and missed, which led to a lot of low punch outs. As constricting as the front nine felt with all the tee shots that should have been faded, the back nine really let me cut loose, with holes that mostly doglegged to the left or were relatively straight. By my second nine holes, I had achieved a level of comfort with my swing on the tee, and was hitting my driver 20 to 30 yards further and leaving significantly better approach shots than just an hour earlier. As manicured and fluffy as the bunkers were, they were still hazards. There were plenty of bunkers in play, protecting both fairways and greens, but not so many that the layout felt too penal. 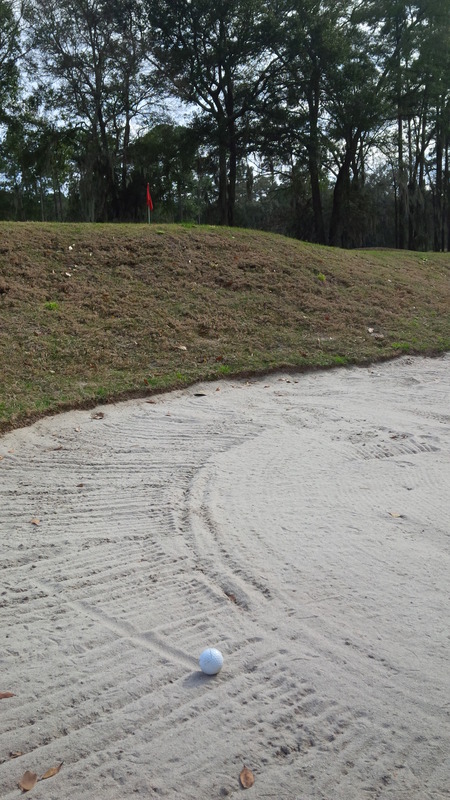 The bunkers’ sand was impressively soft and fluffy, allowing even my feeble bunker game to get out of the hazards in one try. I was 0 for 4 on sand save attempts around the greens, but none of my bunker shots were disastrous skulls or complete whiffs. The closing 18th hole was definitely the Hills Course’s signature hole. 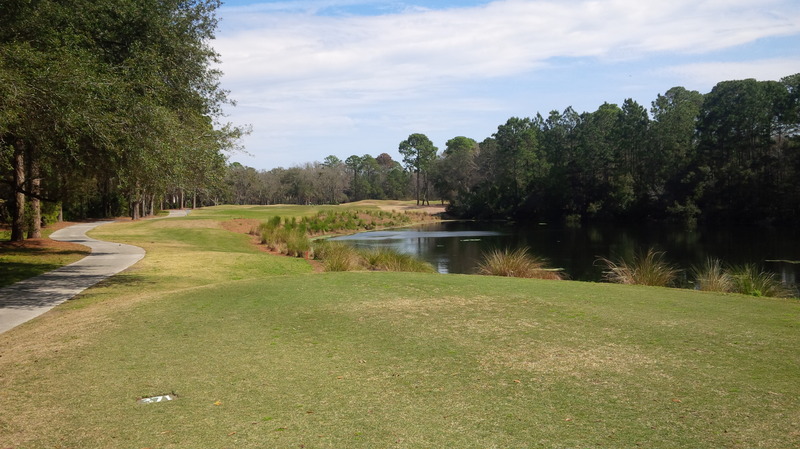 The thin ribbon of a fairway wrapped right to left around a sizable lake that devilishly hugged the length of the hole from the forward tee all the way to the back of the green. It was almost sinister how progressively more narrow the fairway became the closer to the green one got. After bailing out far to the right, I hit a miracle low, driving 3-hybrid to just right of the green, but failed to get up and down. Walking off the 18th green, I felt utterly satisfied just to be on the golf course. It was an enjoyable round, though I don’t know that it would be particularly memorable if it weren’t the first golf expedition of the year. Save for one or two particularly harsh dog legs, and the terrifying sight-lines of the 18th hole, the golf course was full of subtlety, which may well be the beauty of its design. That’s not an optical illusion; the 18th fairway is painfully narrow, with no mounding or other protection against careening a draw or hook right into the lake. I only hit six fairways and failed to convert any of my three birdie putts on the way to posting a 91 for the day. But it was early March, I was wearing shorts, and I observed several azaleas in full bloom on my journey, so all felt right with the World. 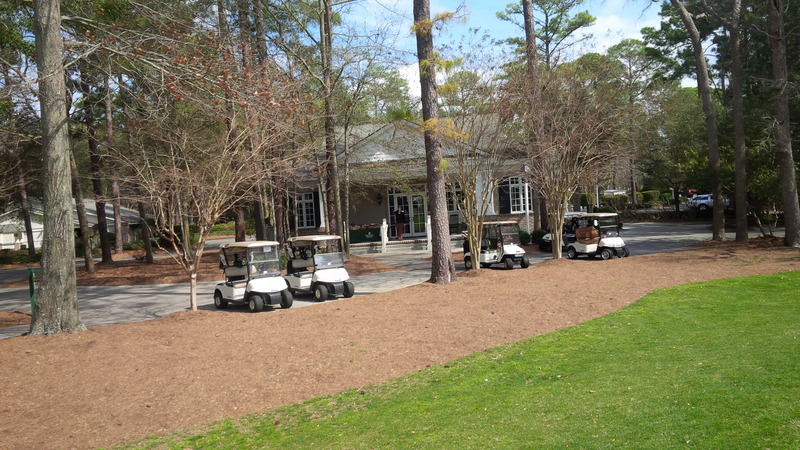 The $70 fee included not only the greens fee, cart, and small bucket of balls, but also a modest voucher at the club’s Grill Room, which was the aptly named bar and dining area open to the general public. The manly, social club appropriate room, which was adjacent to a members only dining room, occupied about a quarter of the first floor of the main clubhouse. It included a full bar and several televisions, all but one of which were tuned to the Golf Channel. 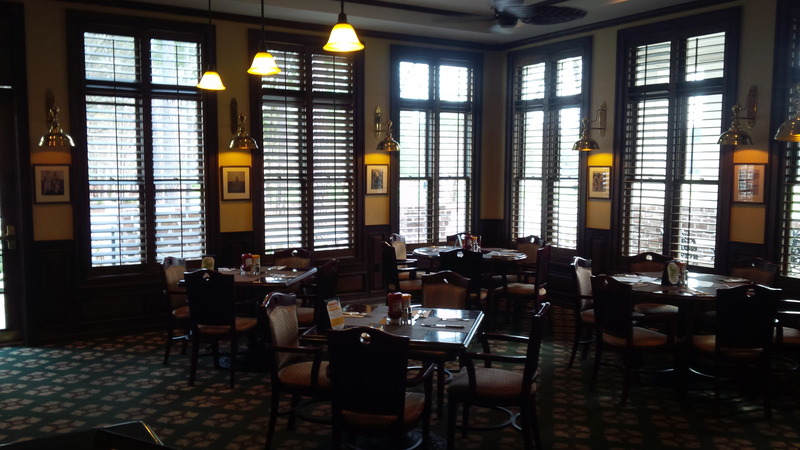 The Grill Room at the Palmetto Plantation Club looks, sounds, and smells like it should be filled with old men in absurd golf clothes, telling stories, hiding from their wives, and generally having a grand time. The Grill room offered a complete menu that included some unique takes on standard pub and grill room fare. The sweet iced tea was more like tea flavored syrup that literally made my teeth hurt, which I respect as perfectly appropriate in the Lowcountry. I opted for one of three house specialties: a grilled to order hamburger topped with pulled pork barbeque, all slathered with the house barbeque sauce and an enormous slice of cheddar cheese. The bartender was accordingly friendly, with the subtle remnants of a charming Jamaican accent. The Palmetto Hall Pro Shop is understated, but contains all the golf merchandise and memorabilia a golfer could ever need. 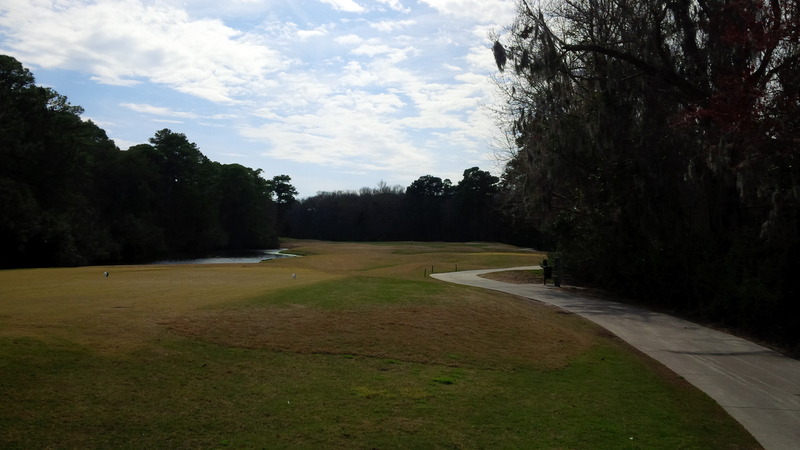 It was a good round on a good golf course, and a great start to the week long Hilton Head adventure. I felt like the course presented a fair challenge. Personally, I would have preferred a little more variety in the shot-making that the front nine required, but the routing wasn’t so bad as to prevent a return. For the price, I would definitely play the Hills Course again on a future visit, though I would prefer to see what the course looks like later in the springtime, once the Bermuda grass has filled in. ← March Question of the Month – What do you practice?